Wauben Architects designed HomePod, a plug-and-play housing solution for refugee housing on vacant lots. Despite its compact size that measures just 0.8 meters in width and 2.0 meters in height, the HomePod can transform any space into a fully self-contained residential unit with a bathroom, toilet, kitchen, and utilities. The contemporary and ergonomic design is not only fully compliant with current regulations, but is also energy efficient—for example, waste heat from the fridge is used to heat tap water—and can be installed by four connectors in just 10 minutes after the main infrastructure has been built. The designers estimate that the HomePod can reduce costs by 80 to 90 percent as compared to traditional transformations. Wauben Architects designed HomePod, a plug-and-play housing solution for refugee housing on vacant lots. 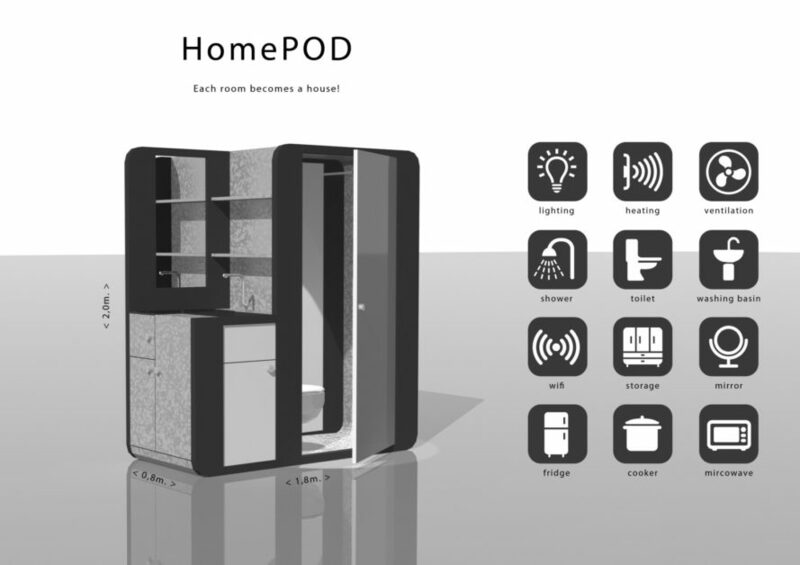 Despite its compact size that measures just 0.8 meters in width and 2.0 meters in height, the HomePod can transform any space into a fully self-contained residential unit with a bathroom, toilet, kitchen, and utilities.